SUITS – smaller to medium sized properties. SPRAY OUTDOORS around your home, lawn, garden, patio, pool, take on camping trips and to the kids games. EASY TO USE - simply mix 4 oz. of Mosquito Magician Concentrate to each gallon of water to the provided container. Apply the solution to your plants & grass. The supplied gallon fills the 2 gallon bottle 16 times, which is enough to treat 128,000 sq feet, or a small property up to 32 times. Mosquito Magician allows you to create a “bug free bubble” around your yard so that you can enjoy your outdoor space without being chased indoors! CLICK ADD TO CART NOW TO TAKE BACK YOUR YARD! PERFECT for Small to Medium sized properties. Includes quality Pump Sprayer with 1 Gallon of Mosquito Magician Concentrate. BENEFITS: Easy to use, economical, fine mist spray. Treats a smaller property up to 32 times with the supplied 1 gallon! 100% ALL NATURAL INGREDIENTS - Mosquito Magician uses a non-toxic blend of 6 essential oils including Citronella Oil • Garlic Oil • Rosemary Oil • Lemongrass Oil • Cedar wood oil • Geraniol. These have been used individually but now Mosquito Magician combines them into a potent and proven blend. DEET and PYRETHRIN FREE - safe for kids, pets, and especially the environment. RECLAIM YOUR YARD! Simply mix 4 oz. 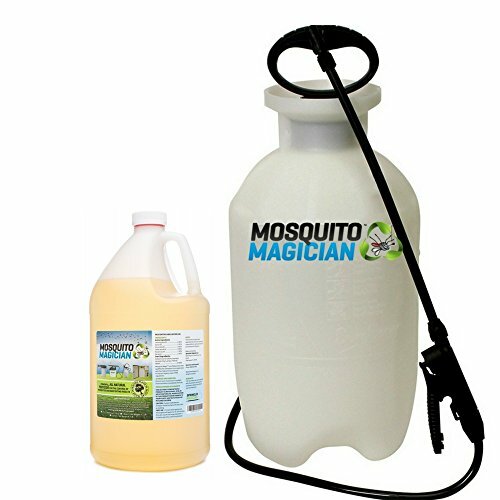 of Mosquito Magician Concentrate to each 1 gallon of water. Apply mixture with sprayer. Mosquito Magician can be applied outdoors around any home, lawn, garden, patio or pool creating a bug free bubble that lasts 1-2 weeks. FULL MONEY BACK GUARANTEE - we know you will absolutely love this product, and we provide a complete satisfaction guarantee. You cannot go wrong with Mosquito Magician. If you have any questions about this product by Mosquito Magician, contact us by completing and submitting the form below. If you are looking for a specif part number, please include it with your message.